With chilly temperatures and icicles, we have the perfect winter for some great snow studies this year! The white coating that covers our landscape here in New England not only offers opportunities for winter sports, but it is also a great creative medium that can support science studies too! 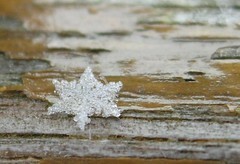 The chemistry behind snowflakes and frost are just waiting to be discovered! Intergenerational collaborations can provide young students with hands-on lessons in the basic science of physics and principles of design at the 5th Great Holyoke Brick Race happening on Saturday, June 4th! Take on the coolest gravity based physics experiment around at the Great Holyoke Brick Race! Similar to the Boy Scouts of America’s traditional Pinewood Derby, the event requires that participants create their own miniature car to race down a specific track. However, unlike Pinewood Derby, the cars are not wooden – the main piece of material is a brick! Sponsored by Paper City Studios and the Massachusetts Cultural Council, the race is open to participants of any age and from anywhere in the world (No need to be a Holyoke native!). Entries can be created by individuals, or by teams of any size, allowing for lots of intergenerational collaboration and knowledge pooling. The event can be used as a means of providing hands-on physics learning. Each car will need to be carefully designed and built with attention to the basic principles of physics. Depending on the age of participants, car-building can lend itself nicely to in-depth explorations of mathematical ideas and the principles of design, too! The race will take place on Saturday, June 4th, 2016 on Race Street in Downtown Holyoke. Check in for racers will begin at 10am. Event runs 11am-3pm For more specific information regarding entries, as well as design suggestions, visit the race website: www.brickrace.org. Yo-Yo School Can Unlock Secrets of Physics! The yo-yo sleeps for now but this simple object, containing two discs, one axle and long string, is an instrument for gravity-defying trickery, which requires some grounding in the principles of physics. Not many toys can boast over 2,500 years of use worldwide, but the yo-yo has enjoyed consistent use in hundreds of cultures for nearly three millenia. Seemingly moved by magic, the yo-yo is little more than a well-designed tool to demonstrate basic principles of physics. Consisting essentially of a spool and a string, yo-yos (when in the hands of a skilled operator) can spin, jump, hang, and bump in patterns that are so graceful and speedy that they seem almost impossible. 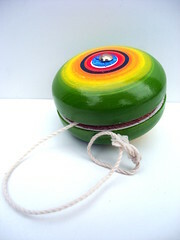 And for those of us with few yo-yo skills, they may feel impossible to perform, too! Luckily, folks who want to learn to better understand the physics and physical movements behind yo-yo tricks have numerous resources available to them – including both weekly classes and a world class championship right in western Massachusetts’ Pioneer Valley! Popular education-based store A to Z (located on King Street in Northampton) hosts Yo-Yo School three times a week inside their store, and their teachers are true masters. Amongst the crew of talented yo-yoists are a world champion and a world class competition judge! A visit to A to Z Yo-Yo School ensures expert instruction and access to a wide variety of yo-yo styles and colors – if you don’t have a yo-yo at home, you’ll be able to pick out a favorite before class begins. Exactly how reliable and fair is the coin toss? For a coin toss to be completely fair, a coin needs to be perfectly constructed. Be a math citizen scientist, and join the project in figuring out the coin toss! 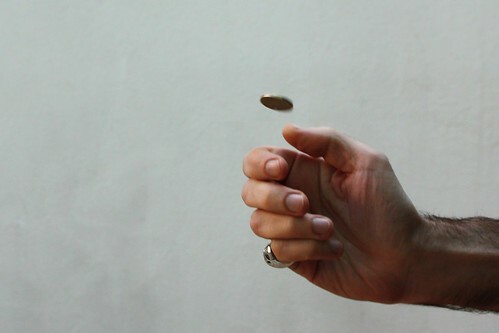 Flipping a coin is perhaps the most bias-free means of problem solving known to man. The simple choose-a-side-and-flip procedure leaves decision making entirely up to fate, providing quick solutions without debate. And it’s perfectly fair. Or is it? What does the tradition of Groundhog Day have to do with learning science? Well, when you throw in a classic Bill Murray film, the three things combine for an interesting examination of time loops and the physics behind such a concept! As part of the Science on Screen series, Amherst Cinema will screening Groundhog Day on Monday, February 3rd at 7pm. A comedic classic, the film features Murray as a TV weatherman sent out on his least favorite annual assignment – covering the emergence of Punxsutawney Phil from his hole. Much to his horror, Murrary’s character gets snowed in after the event, and wakes to find himself in a time loop where he experiences Groundhog Day over and over and over. Eventually, he is forced to get creative with his extra lopping time and works to become more in touch with himself.